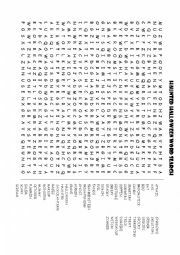 44 Halloween words to find. 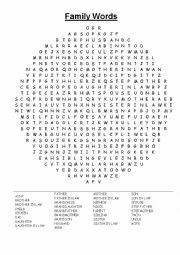 A circle shapes word search for family names (both immediate and extended) and key. A fun activity to accompany a lesson where students learn the different terms for all the family members. Great to use along with a blank family tree where students fill in the correct terms. 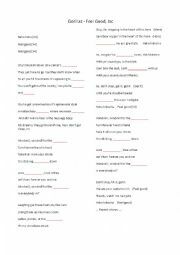 Gap fill, lyric sheet, and YouTube video link for the Bruno Mars song: Locked Out of Heaven. 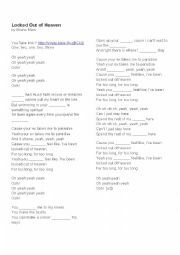 Gap fill exercise using the Gorillaz song - Feel Good Inc. Includes lyric sheet and link to video on YouTube. A good ear exercise as the song alternates from Brit pop vocals to Hip Hop (De La Soul). And who doesn�t like an animated band? A fun video to watch as the students train their ears. 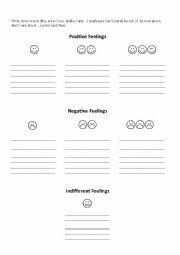 A sheet where students can classify vocabulary associated with Like, Dislike, and Indifferent. 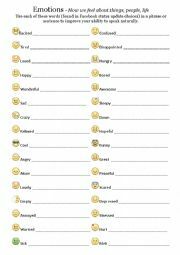 Students use the smiley faces to determine the degree of "like" or "dislike" for each word.